If you haven’t heard of the Wonder Pets you are not alone…It was once a show on Nickelodeon but it is no longer on. We don’t have cable so Solon watches most of his viewing pleasures on Netflix. All 4 glorious seasons are on there! It is actually really cute and most days I will put Vera down for a nap he gets to watch 1 episode. Luckly for me since is kind of a thing of the past, all the Wonder Pets party stuff was on clearance at our local party store. Everything was just a $1, the centerpieces, birthday sign, thank you notes, games, etc. SCORE! 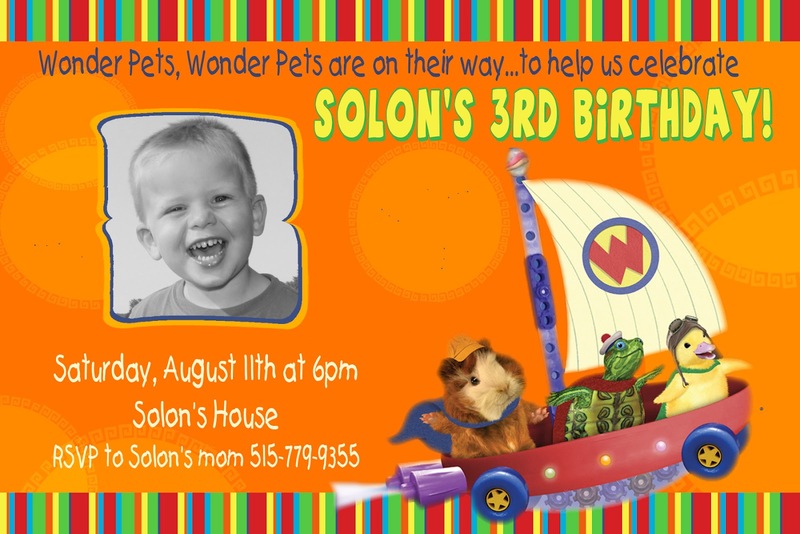 I am not HUGE into “themes” like this but Solon was elated so cutsy-ed it up and we had a great backyard bash! I ordered these cookies as a “splurge” since I saved so much on all the decor…these were the “gift” for coming to the party. Wonder Pets are school pets that after school hours turn into super heroes and save animals….hence the cape, little flyboat, etc. Three Chicks Bakery did a fabulous job! The cupcakes – I ordered little “wonder pet” picks off of Etsy – they turned out so cute! The dessert table – we had cupcakes and ice cream with toppings bar! My mom whipped this cape up for Solon – they sell them on Etsy for $30…thanks Mom….now if we could get him to wear the cute thing! …and last but not least I ordered these adorable invites on Etsy….another splurge! More pictures to come of the fun party!